The skill evaluation aims were Observation, Tonal Range, Shading and Challenge. I think the proportions of the objects were good and that they do look like the objects they are meant to represent. I used a selections of pencils I had including HB, 2B, 4B and 6B pencils. I did create a pencil shade scale and was satisfied on the whole although I’d like to have achieved darker tones but didn’t have the correct pencil to allow me to do so. In the drawing I did manage to use the range of tones in the image, from the white box to the darkest point in the shoe. 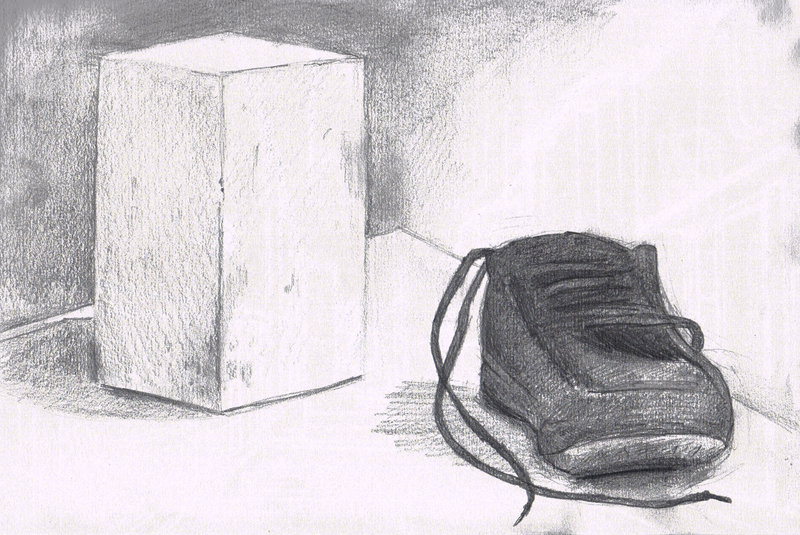 The darkest point in the drawing was definitely beneath the laces of the shoes with the brightest part being the direct light hitting the box, I think the lighting on the objects was conveyed satisfactory although not perfect as tonal drawing is not my strongest skill. I think the shading is let down in the background where I didn’t spend as much time on. The paper quality also did not allow for the smoothest shading. If I were to do any future tonal drawings I’d like to invest in some better sketchbook paper. Some challenging parts of the drawing included the surface of the cube which was pretty smooth and very bright white. I did add in any scratches or dirt on the white block just to give it some more definition. The shoe was also difficult as the material didn’t allow for highlights and appears to be consistently black. This meant shadows where the only thing that allowed the object to show its shape.